It’s ironic how healthcare professionals, while saving others, are so prone to illnesses. Of course, this is only logical, since they’re constantly surrounded by hazards and disease. But, the most dangerous hazard is probably biomedically related. Still, there are hundreds of things that can be bad for them if they aren’t careful. Considering the sensitive and volatile nature of the industry, it’s important that employers take extra care of their healthcare workers. Here are top 7 tips that are guaranteed to keep your workers safe and in top shape. So, one of the things you can do is to work in pairs. This means that the workload is distributed between two individuals, meaning less work, but also two eyes and two ears. This means that you can pay more attention to your surroundings and, if you are going to transport some heavy objects, you get an extra pair of hands. However, do try to get someone of a similar height and build if you’re going to carry things. Otherwise, you can get injured because of the lack of balance. Always, always, always follow due diligence and do all necessary maintenance checks and follow all maintenance procedures. So, check any cracks, and damage, inspect bed cranks and wheelchairs and do everything else that needs to be done in order to keep everything in good working condition. A lot hinges on your place of work having proper and functional equipment. Remember that when you lift things, you must keep proper posture at all times. So, if cranks, pulleys, and machines aren’t available, make sure to master proper lifting techniques for medical staff. There are some specifics in this industry which require special care on your behalf. Used needles are a very credible potential medical hazard. The risk of infection and transference of diseases is far higher with improper needle handling. Make sure that everyone is aware of the proper method for handling needles. Setting up a training seminar is a good idea if you want to ensure that all your employees follow procedure. Put up some posters and reminders, hand out booklets, and just generally advise your employees whenever you can. Also, get some safe needles. They cost a bit more, but they give your workers more protection and decrease the chance of injury and infection. 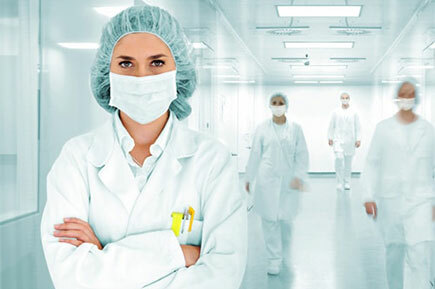 From special gloves to masks and scrubs – all of these things are absolutely essential to every healthcare worker. These essentials protect you from physical harm and keep germs away from sensitive areas of your body. This protective gear allows you to function at peak efficiency which is a definite plus for your patients and your career. To enable you to distribute protective equipment properly, you need to be aware of the specific dangers of every department in your medical centre. Different working environments means each of your employees has different protective needs. For instance, those who handle laundry need sturdier gloves because they are at risk from stray needles. Medical experts that work with patients that suffer from highly infectious diseases need high-quality masks. The list goes on. In most cases and places, spills and leaks aren’t considered a huge danger. This is not the case in the medical industry. Here, things that leak can be more dangerous than injuries obtained by slipping on a wet floor. This is especially true for the biological matter like blood and other bodily fluids that might potentially contain infectious bacteria/strains. However, don’t ignore the simpler hazards. Broken glass strewn all over the floor can potentially be harmful to your patients or even yourself, so report even these things immediately. Lastly, there is a very real risk of physical assault from certain patients. While much rarer than other risks, it’s still something to consider. It is important to identify patients with a history of psychiatric disorders that involve violence. If there are any that are probable problem cases, make sure that handlers of such patients are working with a partner. There are a lot of important things to consider when it comes to occupational health and safety in the healthcare industry. 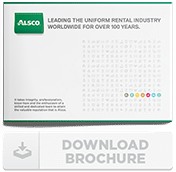 Alsco has been one of the top service providers for the needs of many companies from different industries and the medical industry is no exception. Contact us today to find out how we can help keep your workplace safe!